One of the most popular flat roofing style for commercial enterprises is EPDM roofing in Dallas, TX. 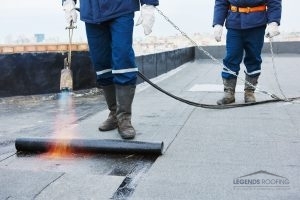 Legends Roofers can show you how this roofing option became so popular when we install a durable EPDM roof for your business that’ll last two decades. For business owners who already have an EPDM roof system, speak with our local roofing experts about energy efficient roof coatings to further improve roof performance. If you’re ready to save money with EPDM roofing in Dallas, TX call Legends Roofing today at 214-321-3293. EPDM Roofing is a great answer to many commercial roofing problems. EPDM roofing or ethylene propylene diene monomer roofing is one of the most popular commercial roofing options because of its affordability and longevity. EPDM will last up to 30 years with great maintenance service by Legends Roofing contractors. If installed correctly, repairs for an EPDM customers are quick, simple and can be few and far between. This is because the rubber/plastic mix of EPDM roofing puts up a great fight in hot, cold or stormy weather. Together, the materials of EPDM roofing create a great defense against the elements like hail, snow, and the hot sun. Is it Time To Switch To EPDM Roofing? It’s time to switch over to EPDM roofing if you own a commercial flat roof but you’ve had problems dealing with the heat or hail of Texas weather. Constant leaks and regular roof repairs often mean it’s time for a roof replacement. Talk to a Legends Roofing contractor for something different and effective against the elements. When it’s time for a roofing replacement opt for new roofing that will save you money not only during installation but over time. As a business owner, you’ll save time by switching to an EPDM roofing style that requires low maintenance and minimal repairs. Expect minimal repairs and low-cost installation for EPDM roofing with Legends Roofers. To get the most out of your roof, we recommend you install an affordable, reflective roof coat. With this extra protection on your roof, you’ll not only have a stylish, low maintenance roof, you’ll enjoy energy savings as well. Legends Roofing contractors understand how much of a headache constant roof repairs and leaks can be when you’re trying to run a business. If you’re ready for a roof replacement style that could last you up more than 20 years with minimal repairs, call us now for an initial appointment. Well take a look at your current roof system and make an accurate estimate for you. Contact us today at 214-321-3293 to get started with EPDM roofing in Dallas, TX, the perfect roofing solution for your business. Updated on August 4, 2017 at 1:40 pm by Legends Roofing.